Karalyne smiling bright during treatment. Babies are known for bringing joy to everyone they encounter. 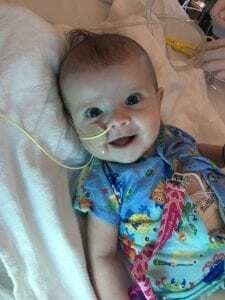 Twelve-week-old Karalyne, who was diagnosed with acute myeloid leukemia (AML) in February 2018, is no exception. “Karalyne does love to smile. She would rather look at your smiling face than any baby toy waved in front of her,” says her mom. This sweet girl spent the first few weeks of her life in the PICU and her unexpected diagnosis has left her family’s financial situation unstable. Karalyne has six siblings, all of whom her parents continue to support financially. Her mom is on maternity leave and her return to work is uncertain due to Karalyne’s diagnosis. Dad is doing all he can to maintain his small commercial flooring business, but has had to turn down jobs due to the timing of treatments and his inability to travel the way he used to. The family recently learned that Karalyne has two genetic mutations that make her AML even more aggressive than usual, meaning she needs a bone marrow transplant as soon as possible. They are expecting another round of chemo before Karalyne can rest at home. The hope is that this latest round of chemo will place her in the temporary state of remission needed for the transplant. Through the support of our partners at JUST TRYAN IT, we were able to provide Karalyne’s family with assistance that directly paid for their rent and car insurance. This will help lessen the financial burden on the family, allowing them to stay strong together, and, most importantly, give Karalyne access to the life-saving care she needs. Karalyne is on day 24 of treatment and her family is holding onto the good news that there are 87 potential donor matches for her transplant. She is still smiling through it all.